The Ford F-150 Raptor just can't be the only high-performance pickup truck out there, right? That's what we thought. It's capitalism at its best when competition thrives. 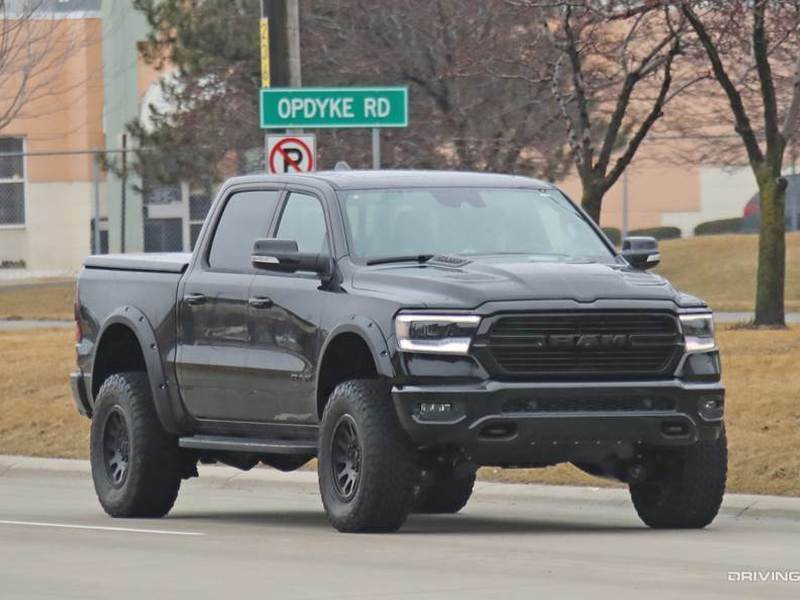 That's probably not what Ram Trucks was thinking when it created the 1500 Rebel TRX concept back in 2016, but who cares? This thing is one serious bad boy, and now spy shots confirm it's in the works. Aww yeahhh. Rather than the fancy red, highly tricked out concept version (below), the one seen testing is clad in all black, and we mean ALL black. From the wheels to the body trim, window trim, bumpers, and emblems, it's all stealth. We're guessing the new truck will probably get more than just one color, but black is a very good place to start. What's most important to note is the serious suspension that makes this tester sit higher than the concept vehicle. The rear axle may also be thicker and wider than the standard 1500's, possibly pulling the one from the bigger Ram 2500. That means this thing will be potent, tough, and ready for action. The shocks look like remote reservoir off-road shocks, which means this thing will be off-road ready. We have no clue about the suspension travel, but it appears that there will be more than the concept's 13-inches. In order to be competitive with the Raptor's abilities, the power's gotta be there. Supposedly, the TRX will get a 707-hp Hellcat engine with the supercharger. That's very good news since the Raptor's potent 450 hp engine will get eclipsed by the TRX in a huge way. The TRX should launch sometime before 2022, and we can't wait.